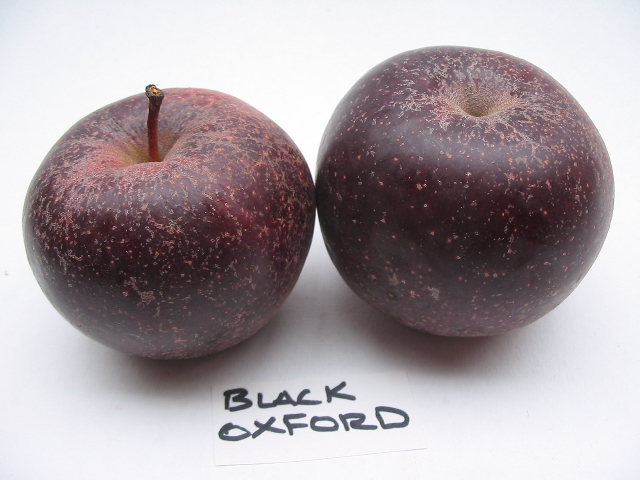 Black Oxford is Maine’s most famous apple. In his book, The Apples of Maine, George Stilphen writes: “Black Oxford was found as a seedling by Nathaniel Haskell on the farm of one Valentine, a nailmaker and farmer of Paris in Oxford County, about 1790 and the original tree was still standing in 1907, the farm being then owned by John Swett.” Very old trees are still thriving in many central and southern Maine locations. A few years ago John visited a tree in Hallowell that was planted by Dr. Benjamin Vaughan in 1799. It bore seven bushels that fall. The medium-sized, round, deep purple fruit has a blackish bloom; from a distance might make you think you’d discovered a huge plum. Because of its unusual light pink flowers in spring, you could plant it as an ornamental. Black Oxford is an all-purpose variety, and we recommend it for everything: fresh eating, pies and cider. Leave the skins on for a delightful pink sauce. (The skins will dissolve.) Best eating from late December to March, it keeps all winter into spring. We ate the last one from our 2010 harvest in July 2011 – somewhat spongy but still flavorful.